Over the recent years shoes have become a focal point in fashion. This means whether these are sports trainers, street shoes or workwear; your footwear gets plenty of attention. Keeping this in mind, rather than going out of your way to buy a new pair every time the other one gets a little roughed up, it is a far more practical and long-term solution to go ahead and take care of your products yourself and never let them become worn out in the first place. You will be surprised just how easy it can be to up-keep your footwear if you have the right products to do so. So find a great way to preserve your footwear and help your customers and business partners with branded shoe care products as advertising items, to be able to maintain high heels, lace-up shoes or boots. Fitted with your individual brand slogan or company logo, these promotional products will ensure enthusiasm to take on the services your business offers because your company knows just how much fashion matters. The first form of shoe polish dates back into medieval times where a waxy product was made use to both softens and waterproof shoe. As leather rose in popularity in the 18th century, ‘shine’ became a known concept in regards to shoes and boots, back then referred to as ‘blacking’. In 1795, the Warren brothers (Thomas and Jonathan) began to produce what we now refer to as shoe polish. It wasn’t until 1906 however that these products reached popularity as previously the sales as well as interest and association with sophistication was limited. In time however the practice of shoeshine boys in cities became commonplace. The first shoe polish to resemble the modern varieties to primarily induce shine was created the British Commonwealth brands in 1889. Demonstrate an understanding of quality and appreciation of old world craftsmanship. We at allbranded know just how important it is to look great your best; much like your brand, identity matters. Since we are highly susceptible to even the subtlest of accessories, it is up to us to make the most of it. So take a shot in a far more unique promotional product that will not suffer in the rate of usability and have you stand out from the rest of your competitors. Whether it’s to add some shine or years to the longevity of your shoes; taking the time out to take care of them is well worth your time. So get the most out of the money you spend on footwear and the need to buy replacements every few months. Your favourite shoes are your favourites for a reason and replacing them can be painful. So why do it if you can very well preserve their usability far longer than their ‘natural’ lifespan? The assortment of allbranded printed storage products leaves nothing to be desired in terms of shoe care. 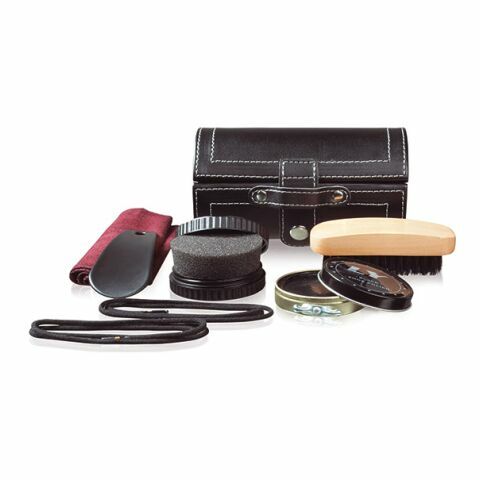 Pamper your customers and fellow employees with some high-quality shoe polish and preservation with our branded shoe cleaning kit for that precious footwear. Even if your customers are not in the habit of polishing shoes, one gifted with these kits they will be sure to start! The regular use and frequent visual contact will make sure your brand will be remembered for the long-term and gain a positive association with not only fashion but preservation and maintenance; much like you’re doing with your customers. For more options check out our promotional notebooks, umbrellas, keyrings, pens, mugs, usb-sticks, and eco-friendly bags!